Victor Landeta, Daniel Rodriguez, and Edwin Solis are in the middle of their fight camps for the ACC event on 11/11/17. All 3 men are just looking to get in the cage after long layoffs. Victor Landeta hasn’t been in the cage in a couple of years himself so he is ready to dominate whoever they put in front of him. Leo ” The Mexicutioner” Muniz is ready to get back after it since his first pro loss. “The Mexicutioner” is an exciting fighter so everyone is looking forward to his return. What seems intense and to aggressive for most, is regular training for use here at the Jungle Gym, even in our kids program! Every Thursday the students of our Lions Of Leadership program get to participate in our stand up sparring class. Our Sparring class includes punching, kicking, takedowns and submissions. Now, why is this type of training important? It puts your child in a situation as close as possible to what a real altercation might be like. With this type of training kids are getting comfortable using the techniques they’ve learned in class with a partner who’s throwing punches and kicks at them. This is going to allow them to get comfortable in these situations, so that if it happens outside of the gym, it won’t be their first time dealing with it. If any of you have questions on sparring or getting your child in the Lions of Leadership program, let us know at the front desk. Lions of Leadership Open Mat is Every Sunday at HQ and Next Month on November 25th at Jungle Gym New Rochelle. These are great training sessions so do your best to be there. You guys should be drilling! Now we all know drilling isn’t the most exciting to to do, and we all would much rather just get into rolling. Now rolling is definitely an important part of improving your Jiu Jitsu, you also have to make sure you’re spending enough time drilling as well. When you’re drilling you get to practice your techniques as close to perfect as possible. It’s hard to practice a new technique when you have someone resisting everything you attempt. Drilling also allows you to burn many repetitions of a technique from what ever position you want. It’d be pretty hard for a newer student to practice their Americana from topside if he’s rolling with someone who’s guard he can’t pass. So make sure you guys have a good balance. When you come in for Open Mat feel free to grab a partner and work that technique you learned earlier in the week. If any of you guys have questions on this feel free to ask any of your coaches. The best way to mastery in any subject is taking it step by step. This is especially true when we talk about losing weight, getting in shape, or achieving a healthier life style. Maybe today isn’t the day you do a pull up, but you could definitely take the steps towards that goal. The most important thing is that you just do something, anything really, that brings you closer to your goals.The one thing you want to avoid is remaining stagnant with old habits that never moved you to the goal you want so hard to achieve. Goes to the Wednesday sparring crew. 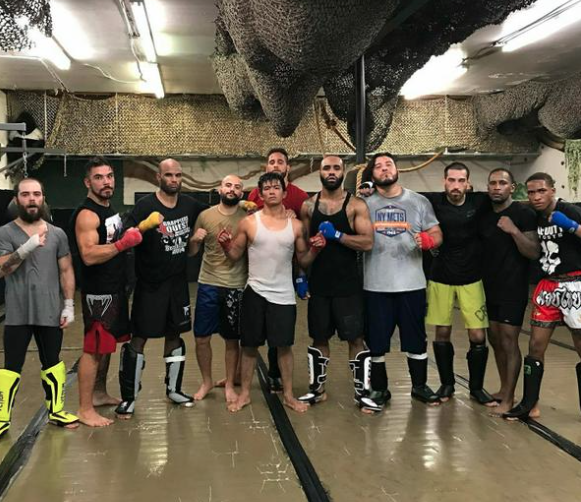 Everyone is really coming together to support their brothers and give them some hard sparring rounds. Without a strong tribe a fighter is gonna have hard time living a fighter’s life.